Registering for the course website (here). Editing your account for the first time. 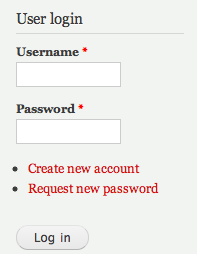 Click on "create new account" under "User Login" in the User Menu block on the right. Create a username that will identify you in the system and that you will use for logging in. Because this site is public on the Internet, your username should not include your last name. You are welcome to use any username or screenname that would not be offensive to others or otherwise inappropriate for a course website. Capitalize your username as you intend to use it; usernames are case sensitive. Enter your email address. You may use your Clemson email address. If you have an alternate one, use the one that you check most regularly. Provide your real name. Note that your real name will only be visible to students registered at the site. Provide your contact information so that your peers and instructor can contact you. This information will only be visible to students and the instructor. Provide the URL of your homepage, portfolio, or blog. Check whether or not you grant permission for your instructor to send you grades via your registered email address. Click on "Create new account" at the bottom of the page. If moderated registration is turned on, registration information will be sent to the email address you listed, so check your email soon after you register. You will need the password that it sends you. Your instructor will approve your registration (if new account requests are moderated), and then you will be able to log in to use site features. If moderation is off, you will be able to use the site immediately.